For use on virtually all roofs, WebSeal is designed to hold coatings, whether water or solvent based. WebSeal makes the roof water-tight prior to application of coating, creating a superior, faster method of waterproofing over conventional 3 course applications, eliminating dependence on the roof coating as a water barrier. WebSeal remains flexible to temperatures as low as -70° F making it virtually impossible to thermally shock the seam causing a leak. WebSeal bonds to a wide range of surfaces including difficult roof materials such as EPDM, TPO, aged PVC, SBS, APP modifieds, asphalt BURs, coal tar BURs, plus all metal roofs, tiles, shingle, aluminum, galvanized steel, gypsum board, wood, polyethylene, propylene, polystyrene, fiberglass, brick, concrete, masonry, OSB, etc. A roof repair job can range anywhere from fixing a leak to re-coating or replacing the entire roof. Nevertheless, in many cases the same techniques used in more severe cases of roof damage are used to deal with smaller issues. Not only can this be expensive and time consuming but thanks to Chemlink Web Seal Roof Repair Tape, it is entirely unnecessary. 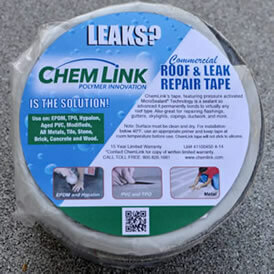 Chemlink Web Seal Roof Repair Tape is versatile, works on all roof types, and is easy to use… Clean, Stick and Apply Pressure – you’re done! Surface must be clean and dry. 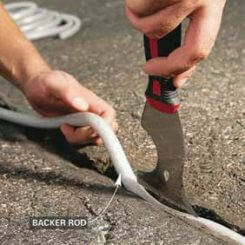 Moisture, dust, dirt or other foreign matter should be removed. Remove oil and grease, etc. 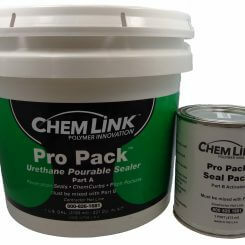 with isopropyl alchohol or a non-residue cleaner such as acetone or lacquer thinner. Remove salt and other contaminants. Install WebSeal over the repair area, removing the release liner gradually to prevent contamination of the adhesive prior to application. Rub or roll with pressure using your hand or steel roller to activate bonding process. This material may be applied to clean dry surfaces from 150° F to -20° F ambient. Treat surface with EternaPrime for installations from 40° F to -20° F ambient. A topcoat of roofing coating is necessary for UV protection.